I tried the above steps. My Canon MX922 was not detected. scangearmp2 exits saying “Internal Error occurred. Scanner driver will be closed”. There is no driver for IP1800 and most then half of IP series. These steps worked for me. Installed both the printer and scanner drivers for PIXMA MX922 in Ubuntu 18.04 LTS. Thanks. Will support for the Canon MX700 be added? Thanks. This ScanGear (ver 3.70) works for me for Canon PIXMA TS3150 and Linux Mint 19.1 Tessa (based on Ubuntu 18.04 LTS Bionic). As I remeber older driver (probably from Canon page – with ScanGear MP 3.30) didn’t work with SimpleScan. Now scaner works also with SimpleScan and “xsane” (directly or in GIMP) and “xscanimage” (directly or in GIMP). All tested with WiFi connection. I didn’t test with USB connection. My MG 5765 is also not listed and when I used synaptic to install MG 5500 at step 3 the installation failed to work. I then removed that MG 5500 package with Synaptic and installed the last option on the list; scangearmp2. I have followed all the above steps but the printer (Canon mp270) does not appear in the printer utility. What device URI should I use? The two examples result in either printer state: idle or not found. Any help on this would be much appreciated. Unfortunately, I got an error message that the PPA repository doesn’t exist for cnijfilter or scangearmp. My printer is Canon Pixma MP250. What can I do? I tried to install my printer again, but I failed with the same error. My system is Ubuntu 18.04.2 LTS (language set to Hungarian); GNOME: 3.28.2. I am novice in Linux, so every help is highly appreciated. You can see the installation sequence and the errors below. Step 3. Synaptic package manager was installed. Step 4. cnijfilter-mp250series was selected for installation. Error: downloading of index files failed. Step 5. scangearmp-mp250series was selected for installation. Try removing webupd8team PPA. Go to Software & Updates -> Other Software, and select and remove the line for webupd8team jave. My previous question is outdated, I found the scanner tool amongst Applications. Thanks a lot! Worked fine here for Pixma G3111!!! There were other likely choices so keep trying if your first choice doesn’t work. Previously running Canon MG7100 series on Ubuntu 16.04 ok and able to output to a .jpg file, but after upgrading (not fresh install) to Ubuntu 18.04 the only way to Scan successfully was to select OCR option. Any other scan would be saved as an empty .png file. Printing was working ok. Installed the new MG7100 series drivers as above, but still only able to Scan using the OCR option. Again, Print works ok. I can live with this, but do you have any ideas as to why this could be happening? But my Pixma TS205 doesn’t work with ppa repository and I don’t understand why. My operating system Ubuntu 18.04. I was reading this driver will be ok for the printer but doesn’t work. Could you help me? My printer Canon MG5765 prints if I add printer in settings>printer. It doesn’t however scan without scangearmp2 so this is all I am addressing here. My printer is not listed in the scangearmp package, however the scangearmp2 package will work on my 64 bit Linux Mint 19 Tara Cinnamon system. 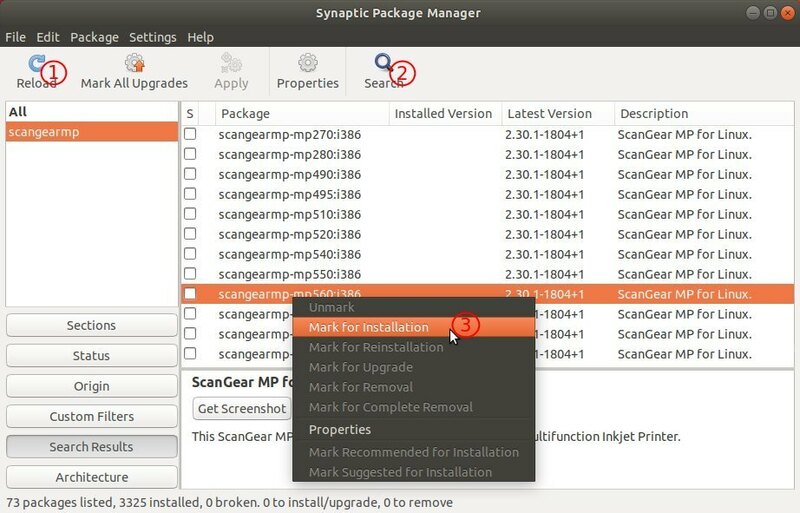 In the final step 3 above, using synaptic package manager select scangearmp2… at the bottom of the printer serial list and apply.